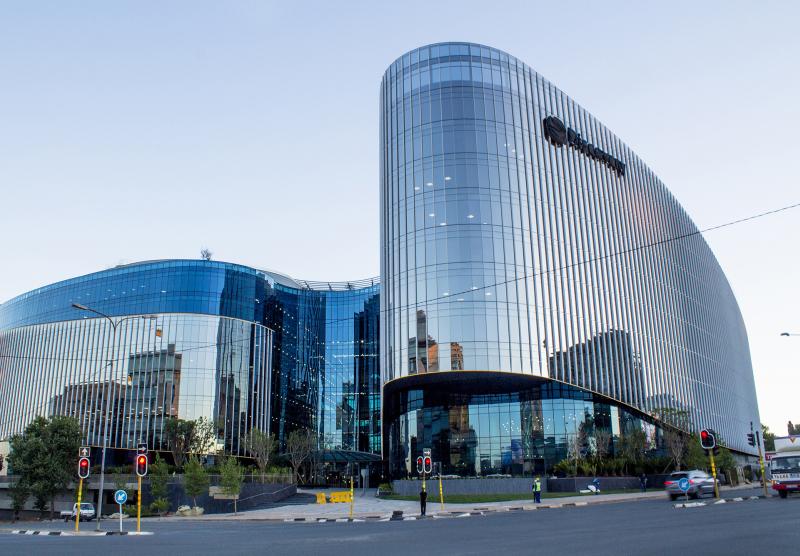 A landmark on the corner of Katherine Street and Rivonia Road in Sandton, the three linked office towers of the new Discovery Global Head Office have expansive glass facades and distinctive atriums designed by Boogertman + Partners in collaboration with Pure Consulting. Manufactured by the joint venture between Facade Solutions and DIRI Aluminium in an on-site glazing factory, the floor-to-ceiling, flush-glazed unitised curtain wall systems span approximately 32 000m² in total and are designed to allow as much natural light as possible into the building whilst maintaining thermal comfort. To bond the insulated glass units to the perimeter framing, Tremco SG200 Proglaze II and Tremco SG300 Spectrem 2 structural silicones were used. For weather sealing and waterproofing the interfaces between the curtain walling and the structure, FoilPro Butyl Aluband Membrane and illbruck ME220 EPDM Membrane were selected. Distributed exclusively by FG Trading, the high-performance Tremco silicones are ideally suited for structural glazing applications and specially designed to meet the frame-bonding requirements as per the Structural Glazing Application technique. The sealants provide a durable, reliable seal with proven structural performance and exceptional resistance to ultraviolet (UV) exposure, ozone and extreme temperatures. FoilPro and ME220, also from the FG Trading range of sealing and bonding products, are facade membranes that are highly impermeable to water vapour and other gases as well as resistant to weathering, ageing and ultraviolet (UV) exposure. The membranes were used to provide an air- and weathertight seal, thus ensuring that the facade remains leak-free and thermally efficient. For optimum protection of the facade during the construction phase, FG Trading also supplied GlasPro™ Film. This innovative product is a transparent, polyethylene-based surface protection film that prevents scratches, dirt, dust and other construction materials from damaging valuable glass surfaces. GlasPro™ 12 is warranted for UV-exposure for twelve months. FG Trading’s trademark blue Xtrusion Tape™ was further used for the protection of the aluminium profiles. The tape provides optimum protection of sensitive surfaces against dust, dirt and damage during storage, transportation and processing, and can be removed without leaving any residue. It is also suitable for uPVC, high-grade brushed steel, smooth or slightly structured metallic surfaces and powder-coated metals. FG Trading was also involved in project reviews, testing programmes and inspections throughout construction. The company’s technical product specialists provided a review of structural glazing drawings and project details including wind loads and glass dimensions to ensure correct silicone contact depth, submission of glazing accessories and related products for adhesion and compatibility testing at its European laboratories and factory, as well as site visits for production inspections and the provision of specialist advice. Caption main image: The floor-to-ceiling, flush-glazed unitised curtain wall systems of Phase 1 and Phase 2 of the new Discovery Global Head Office span approximately 32 000m².